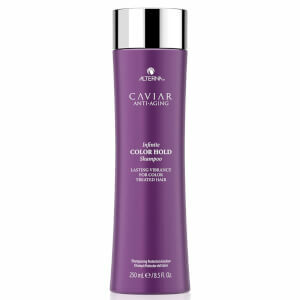 Alterna's Caviar Moisture Shampoo and Infinite Color Hold Vibrancy Serum work in synergy to revive the shine, colour and vibrancy of hair. 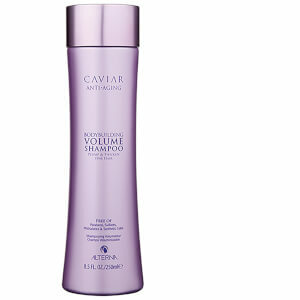 A sulphate-free shampoo that restores moisture and protects colour. Improving the overall appearance of your hair, it expertly lifts away dirt and impurities while promoting radiant shine. Softness, texture and manageability appear enhanced. A revolutionary, multi-purpose hair serum that revives colour and shine while providing heat protection up to 232°C. The dual-use, hair-enhancing serum helps to rejuvenate hair's vibrancy and promote glossy, mirror-like shine. Use as a leave-in treatment to replenish moisture and radiance, or mix with any Alterna conditioner to transform it into a colour-recharging masque. Also helps to reduce hair breakage for healthier-looking locks. Shampoo: Massaje o produto no cabelo húmido e enxague bem. Para ótimos resultados, utilize em seguida o Condicionador Caviar Moisture. Sérum: Para uma utilização sem enxaguar, aplique 2 a 4 doses no cabelo limpo e húmido. Penteie como habitualmente. Para transformar o seu condicionador numa máscara intensificadora da cor, misture 6 a 8 doses em qualquer um dos condicionadores Alterna. Aplique no cabelo húmido e deixe atuar durante 3 minutos. Enxague. Shampoo: Water (Aqua), Disodium Laureth Sulfosuccinate, Sodium Cocoyl Isethionate, Sodium Lauryl Sulfoacetate, Cocamidopropyl Hydroxysultaine, Sodium Lauroyl Sarcosinate, Cocamidopropylamine Oxide, Acrylates Copolymer, Methyl Gluceth-20, Glycol Distearate, Glycereth-26, Algae Extract, Amodimethicone, Saccharomyces/Magnesium Ferment, Saccharomyces/Copper Ferment, Saccharomyces/Iron Ferment, Saccharomyces/Silicon Ferment, Saccharomyces/Zinc Ferment, Phospholipids, Soy Amino Acids, Sodium Phytate, Polysilicone-15Linum Usitatissimum (Linseed) Seed Oil, Helianthus Annuus (Sunflower) Seed Oil, Hydrolyzed Vegetable Protein PG-Propyl Silanetriol, Glycerin, Laureth-9, Caviar Extract, Butyrospermum Parkii (Shea) Butter, Ascorbic Acid, Superoxide Dismutase, Polyquaternium-10, Trideceth-12, Tocopheryl Acetate, C12-13 Pareth-3, C12-13 Pareth-23, Divinyldimethicone/Dimethicone Copolymer, Lauryl Alcohol, C11-15 Pareth-7, Butylene Glycol, Polyquaternium-7, Decyl Glucoside, Dihydroxypropyl PEG-5 Linoleammonium Chloride, Guar Hydroxypropyltrimonium Chloride, Citric Acid, Disodium EDTA, Aminomethyl Propanol, Isopropyl Alcohol, Tetrasodium EDTA, Alcohol, Potassium Sorbate, Polyaminopropyl Biguanide, Benzoic Acid, Phenoxyethanol, Methylisothiazolinone, Fragrance (Parfum). (10-13-26952). Serum: Cyclopentasiloxane, Dimethicone, Phenyl Trimethicone, Dimethiconol, Crambe Abyssinica Seed Oil, Isododecane, Glycerin, Phospholipids, Caviar Extract, Laminaria Digitata Extract, Artemisia Vulgaris Extract, Helianthus Annuus (Sunflower) Seed Oil, Helianthus Annuus (Sunflower) Seed Extract, Echinacea Angustifolia Extract, Cymbopogon Schoenanthus Extract, Rubus Idaeus (Raspberry) Leaf Extract, Rosmarinus Officinalis (Rosemary) Leaf Extract, Salvia Officinalis (Sage) Leaf Extract, Tilia Cordata Flower Extract, Macrocystis Pyrifera (Kelp) Extract, Saccharomyces/Magnesium Ferment, Saccharomyces/Copper Ferment, Saccharomyces/Silicon Ferment, Saccharomyces/Zinc Ferment, Saccharomyces/Iron Ferment, Superoxide Dismutase, Amodimethicone, Divinyldimethicone/Dimethicone Copolymer, Propanediol, Ascorbic Acid, Water (Aqua/Eau), Quaternium-95, Polysilicone-15, C12-13 Pareth-23, C12-13 Pareth-3, Potassium Sorbate, Phenoxyethanol, Pentaerythrityl Tetra-di-t-Butyl Hydroxyhydrocinnamate, Fragrance (Parfum). (10-16-35569).